Two books came in over the past two days. 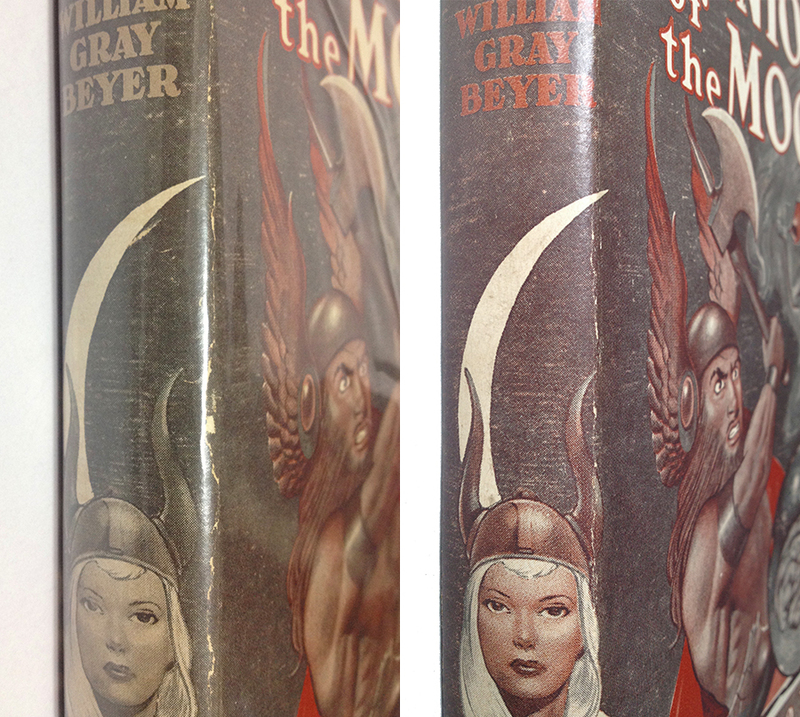 Yesterday came that chapbook Christmas Inn by Gene Wolfe and William Gray Beyer’s Minions of the Moon arrived today. I’ll do a Close Up on that in a moment. 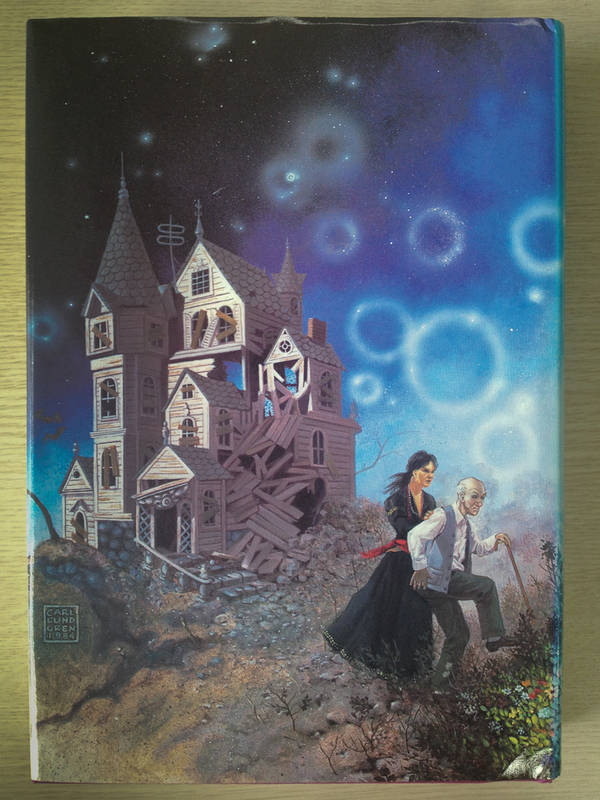 Scott (the chap from whom I purchased Minions) had several other GP titles available, all of which I already had but one – Plague Ship by Andrew North (a pseudonym of André Norton). I grabbed that as well and it’s on it’s way. 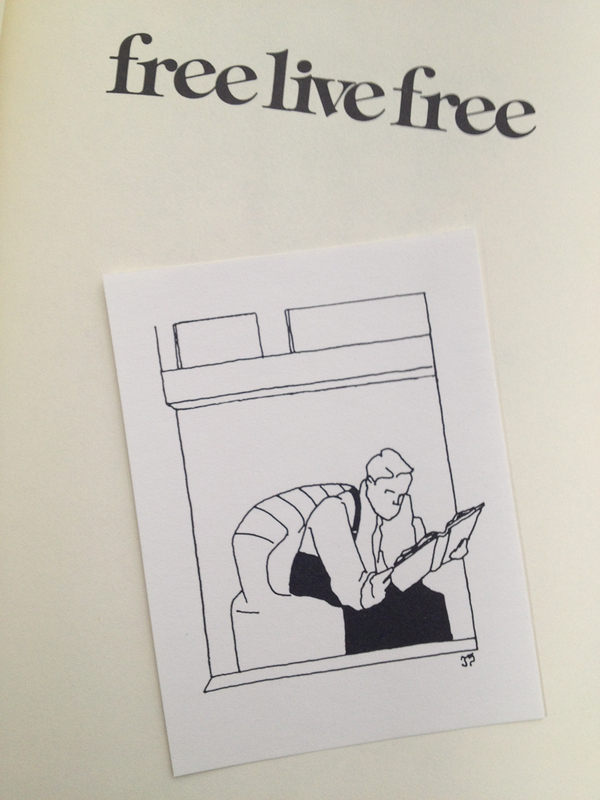 Have a quick look at the chapbook. 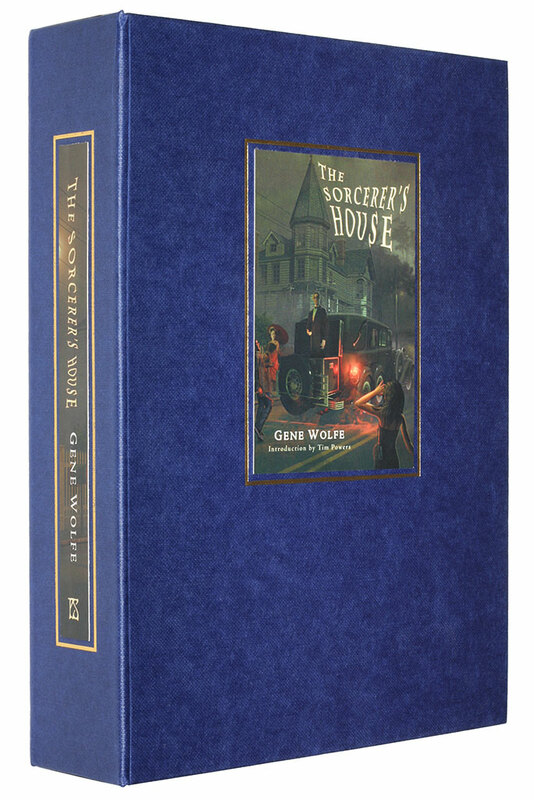 It’s regular octavo size, but is only about 8mm thick – and that’s including the hardcovers! As you can see, this is number 38/200 of those that weren’t given away to PS Publishing hardcover subscribers. Regarding the other book, one of the attributes that Minions of the Moon most often exhibits is a sunned or faded spine on the dust jacket, and one that my original copy displays quite effectively. The reason I bought this copy is because that there is NO fading at all to the jacket. Compare the two here. You can see which is the new non-faded one. The faded copy has the Brodart cover on and that further distorts things. In reality, the difference is much more pronounced than is shown here. Anyway, I’m very happy with the latest copy. The book is in a little better condition overall too. This seems to be the cycle: Post a few times, then sleep for a couple of months. Repeat. It’s been about ten weeks since the last post and quite a bit has happened in that time. Well, some stuff has happened. Got hold of a few more books and things, bought a new (old) camera, got myself a pet, busted up with the girlfriend…. and started reading again. A couple of topics there aren’t really relevant to this blog, but hey, they are interesting and give me something to post about. Lets address things one at a time. When a first got into photography as an adolescent, it was with my father’s camera. An Asahi Pentax H2 he bought as a 13 year old in 1959. That particular model was known as both the Honeywell Pentax S2 and H2 in North America, I believe. I really love that camera and I still have and use it occasionally. A few years ago, I got into the history of Pentax cameras from around that time (late 50s – very early 60s), and there is a sub-culture that exists around the collection of Pentax cameras and lenses of that vintage. They were technically groundbreaking cameras then, and still are one of the most aesthetically beautiful camera designs EVER. I’ve had at one point or another every model from that time, the Original or AP model from 1957, the ‘K’ model from 1958-59 and of course Dad’s H2 which was the next model along in ’59. Subsequently were the H3/S3, then the H1/S1, H1a/S1a and the H3v/SV up until the legendary Spotmatic series came out in ’64, though these later models are not considered truly collectable yet. The H2/S2 is still reasonably common as it was manufactured in greater numbers than the other ’50s models, still, a mint working example with the brown leather case will fetch somewhere around a hundred dollars, or maybe a little more. Of both the AP and K, around 19 – 20 000 units respectively were manufactured. Nice examples of these with the leather case will cost you upwards of $250 (UPDATE 2012/09/18: A nice K model without leather case just went for $305 on eBay). Both the AP and K that I had disappeared into eBay to fund my Gnome Press addiction. Remember I said I’ve had every model from that time? Not true. I neglected to mention there is a model that sits between the AP and the K. It’s the Asahi Pentax S. Produced in ’58-’59 concurrently with the K, this is to Asahi Pentax collecting what I, Robot is to Gnome Press. There are no clear records for volumes of any of these camera models, but the estimates for units of the ‘S’ produced range from slightly less than 5000 down to only 3000. They are as rare as hen’s teeth, massively prized by collectors, and I picked one up in an auction in New Zealand. I got a pet snake. I’m from New Zealand as you may know, and we have one attribute that we share with very few other countries in the world. We have no snakes. Antarctica, Iceland, Greenland, Ireland and New Zealand are the only major landmasses that have no snakes. Actually, Ireland does have snakes now (pets and zoos), but they have no native population of snakes. Anyway, there are absolutely no snakes in NZ, not even in zoos. Of course the odd few make their way over in shipping containers, but they are quickly disposed of, and I guess the odd one has been smuggled in. A guy I used to work with about 20 years ago, his brother apparently brought one back from Australia in some pool furniture made from PVC tubing. I don’t know what became of that. As a person from New Zealand though, actually seeing a snake in the flesh (let alone having one) is a unique experience. She’s a ball (or royal) python – python regius. Her name is Chichi and she’s about six months old and as long as my arm. She’s quite tame and I can pick her up and handle her no problem. She eats frozen mice and rats (I thaw and warm them slightly before feeding her of course..) and will grow to about four feet long eventually. She’s wonderful. We broke up about a week ago. A shame. It’s been ongoing. What was the last report on that?? Ah, right. I picked up The Porcelain Magician and it appeared in my 75% report. The only other GP items I have picked up since then are Lewis Padgett’s Tomorrow and Tomorrow & The Fairy Chessmen, a much nicer copy of Minions of the Moon (no spine fading!! Yay!!) which hasn’t arrived yet, and a Gnome Press Fall 1953 Science Fiction Book Catalog which has also to arrive. An interesting item that last, photos when it arrives. 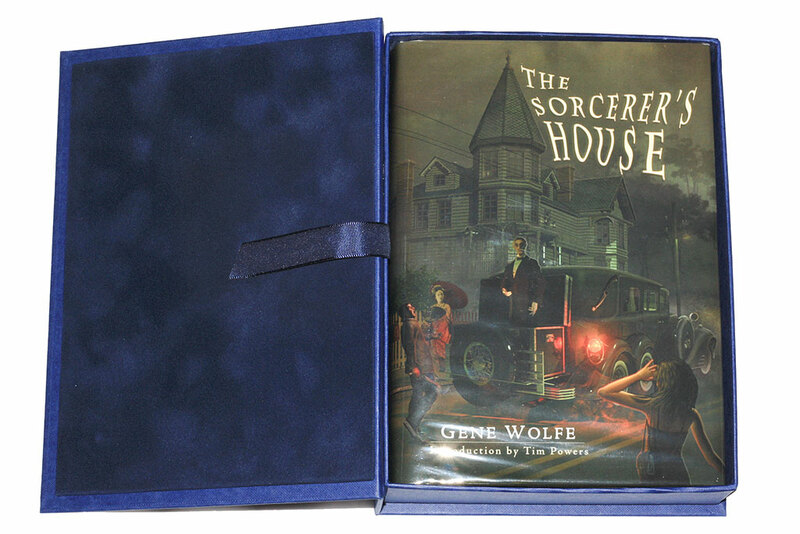 It’s been sluggish on the GP front, but my Gene Wolfe signed first edition collection has expanded considerably. I’ve picked up the collections Plan[e]t Engineering, Endangered Species and (not here yet) Innocents Aboard, the novels Pandora by Holly Hollander and Nightside the Long Sun and Lake of the Long Sun (which when added to Calde of the Long Sun and Exodus from the Long Sun completes The Book of the Long Sun series for me). 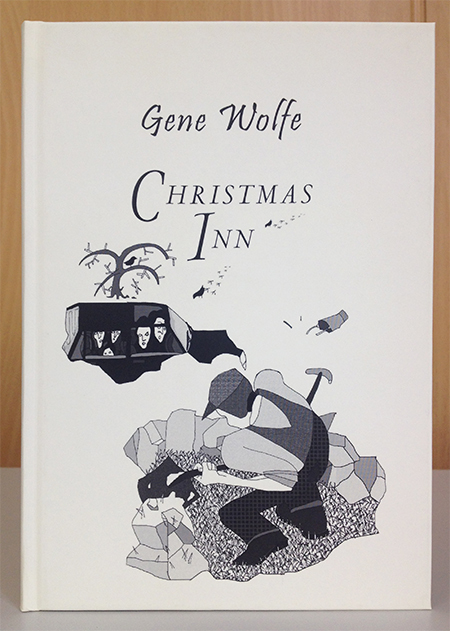 I also picked up one of Gene Wolfe’s limited chapbooks containing the short story Christmas Inn. What’s a chapbook I hear you inquire?? See here. What makes me very happy though is the acquisition of the complete The Book of the New Sun. This is Mr Wolfe’s most famous and popular work and it’s my all-time favorite piece of writing. 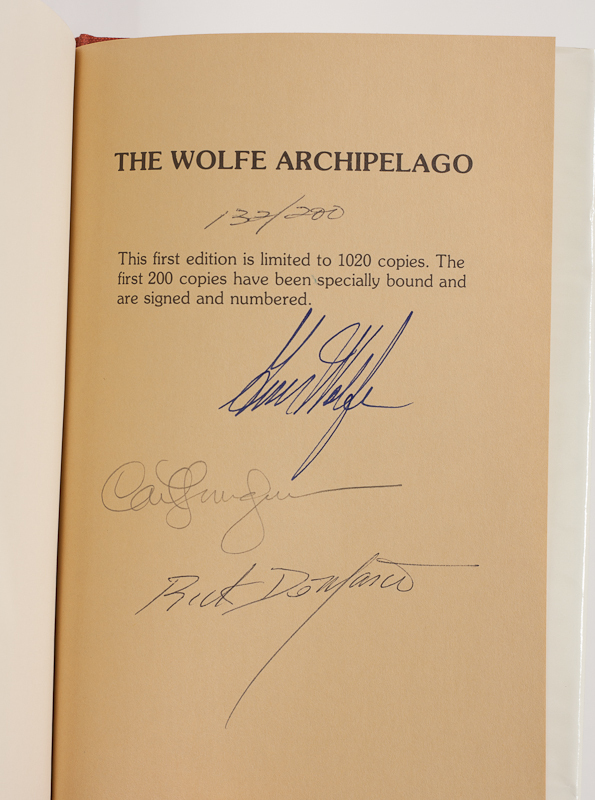 All four books are in fine condition and have identical signed loose pages laid in. The Shadow of the Torturer is below by way of example. I’m reading again!! Started on The Seedling Stars by James Blish. Here’s hoping I actually finish this one!! This is a kind of a mini-Close Up. I would like to show-case the book and I also have a gripe to air. First let’s look at the book, and I’ll illustrate my gripe later. It’s a large hardcover (Medium Octavo I think) and has rather impressive, bright cover art. Just as an aside, I picked this up from my girlfriend’s place last weekend and brought it back to camp with me. The photography was done with my iPhone 4S. Lets check out the back. 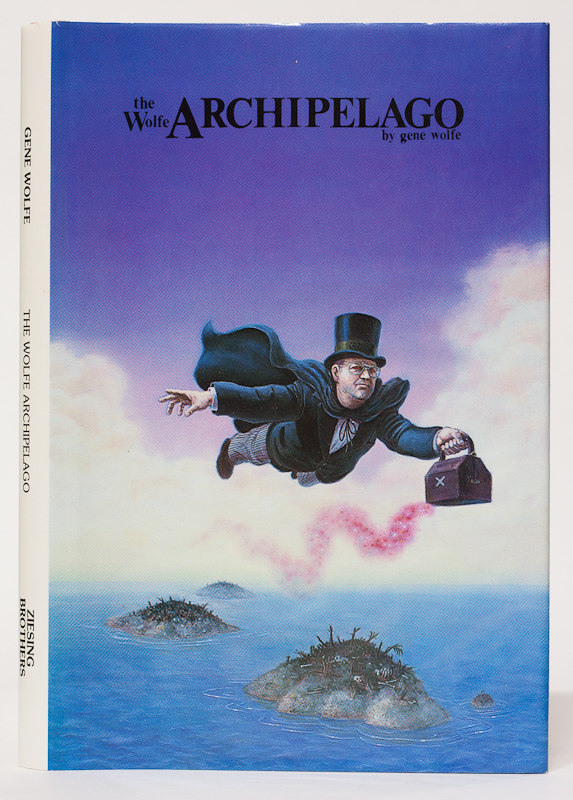 A beautiful wrap-around cover. 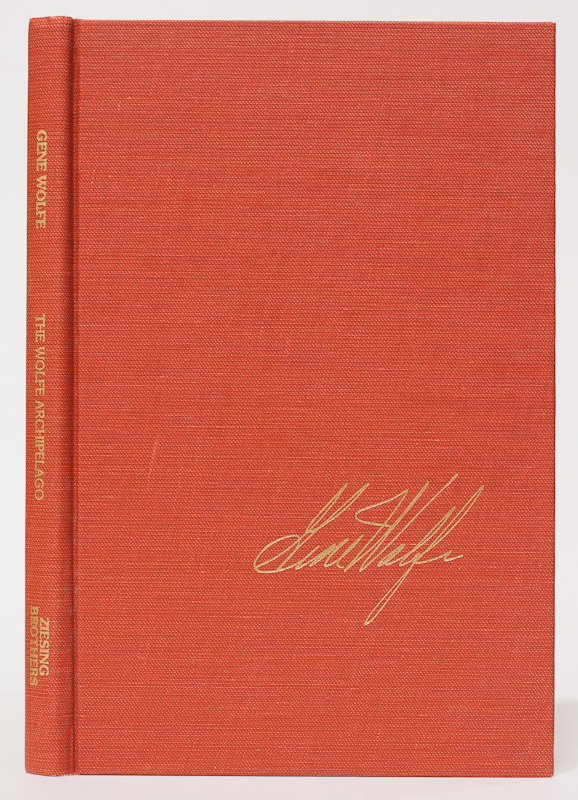 This First Edition was limited to 750 copies of which this is number 39. 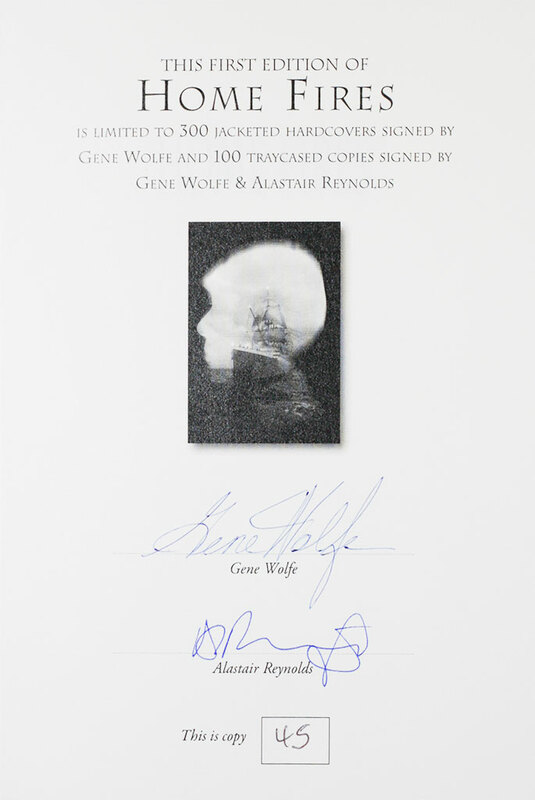 You can see Mr Wolfe’s signature at the head of the list there on the front free endpaper. But wait, what are the other three signatures? Well, second on the list is Carl Lundgren who is responsible for that lovely wrap-around cover. 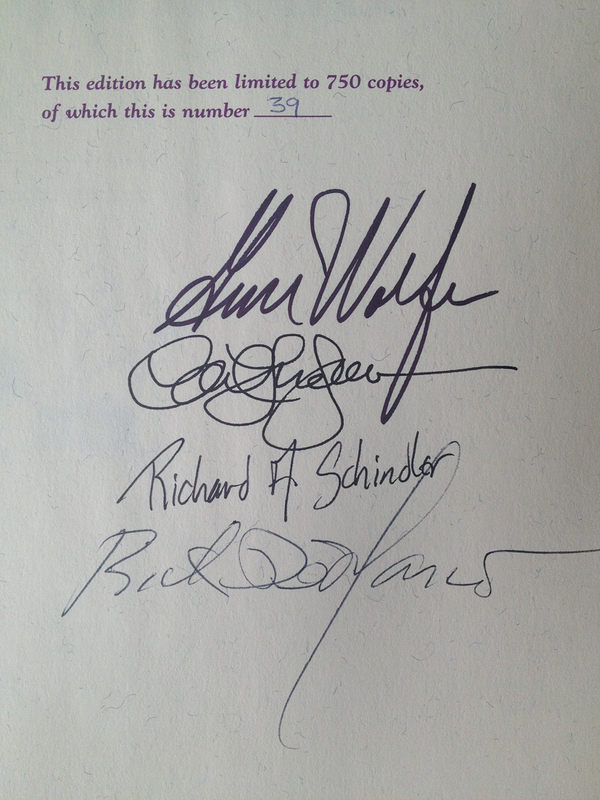 The next belongs to Richard A. Schindler. 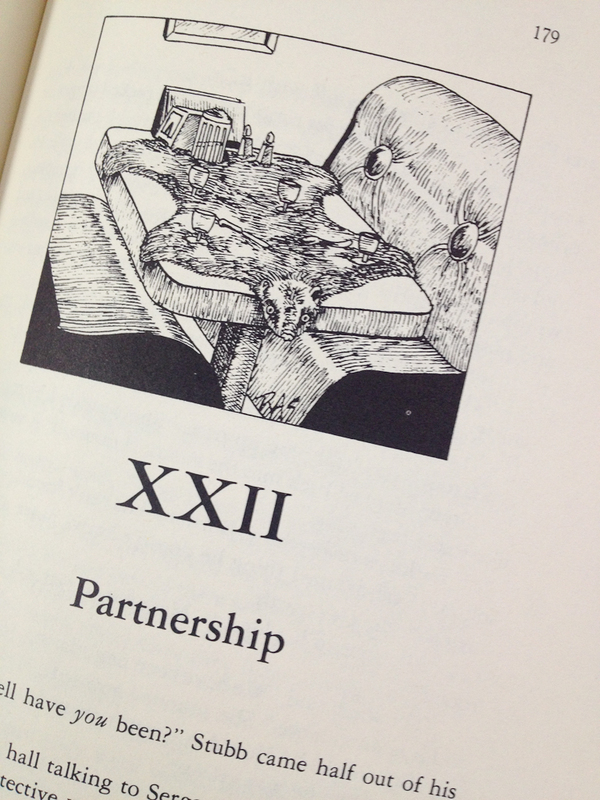 Richard Schindler drew the nice little images that introduce each chapter. 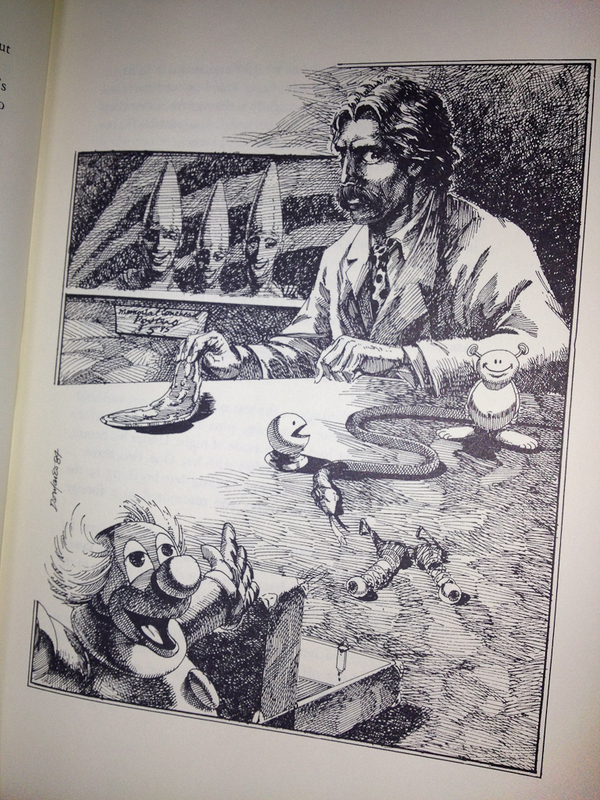 This book also has some (not many) full page illustrations by the last signatory, Rick DeMarco. 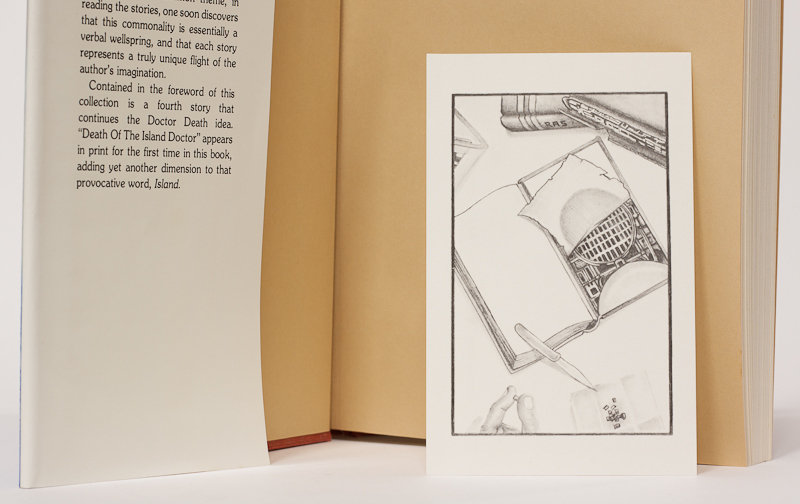 Another little interesting inclusion with the book is a special bookplate laid in. I know it must be special because the artist, though not given the distinction of his own signature in the book, is mentioned with the others on the copyright page. Joe Shea is his name. Nice. Well, that’s the cool stuff out of the way. Now for the gripe. I’ll use this book by way of example. You can see that the jacket doesn’t meet the very high expectations laid down by the front and back images. Goddam sunning. I can’t believe that someone selling a very collectable book wouldn’t notice this. This really disappoints me. It really, really does. To be at least a little fair, the buyer (me) does have a responsibility to ask some questions like “Can you please tell me if there is any sunning on the spine?” or something similar. But when the vendor lists the book as ‘very fine+’ then one shouldn’t really be held at fault for not doing so. Anyway, that’s off my chest (for the time-being at least) so we’ll try to move on to more positive things. I hope Seetee Ship doesn’t harbor any nasty surprises… and where the hell is Lost Continents?? 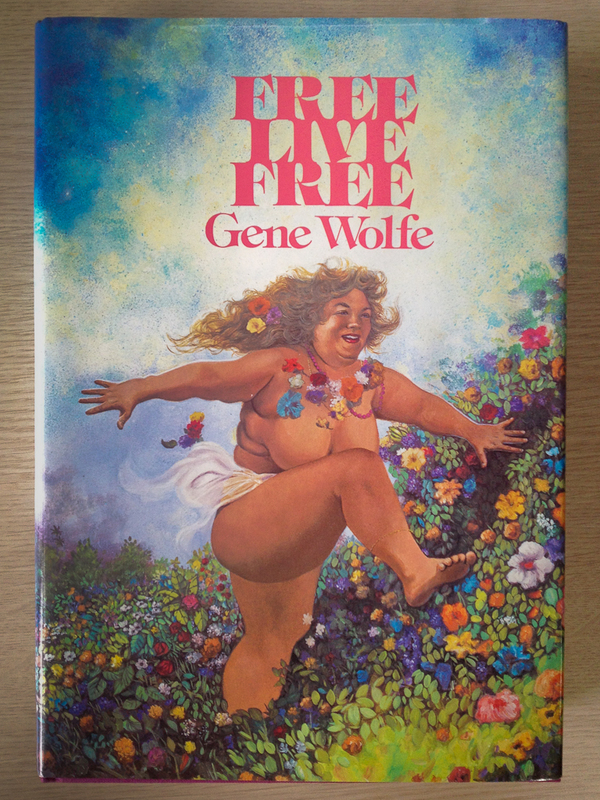 I didn’t mention that I also got the limited true first edition (#39 of 750) of Gene Wolfe’s Free Live Free a week or so ago. Expected soon. Only $30, and in Fine condition. This particular book is normally seen for at least $50. I’ve been very lucky lately in bidding… I’ll keep my fingers crossed. It arrived today. 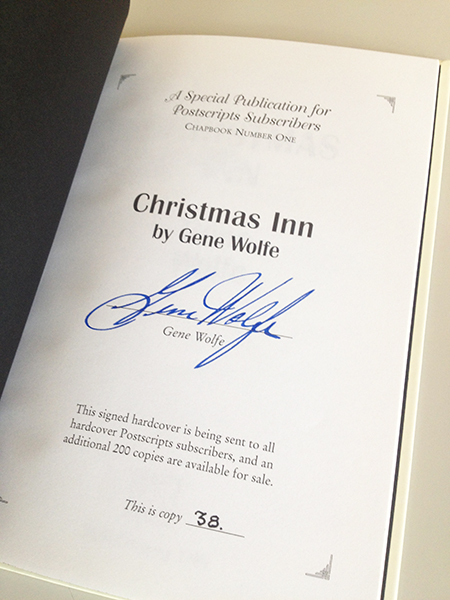 Another very attractive addition to my signed Gene Wolfe first edition collection. 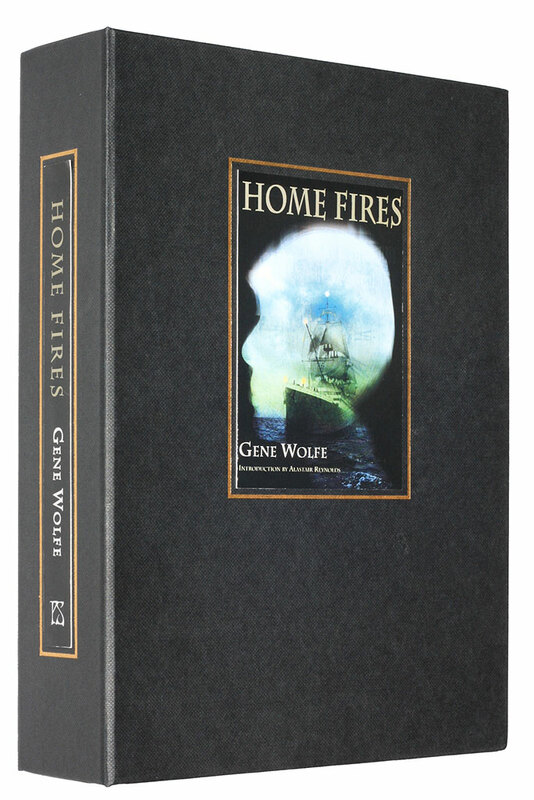 I’m now feeling like I’m wanting to pick up the first tome in this series, 2009’s The Very Best of Gene Wolfe. These are getting pricey… I dunno…. but they are SO beautifully presented as I mentioned in the look we had at The Sorcerer’s House. I might succumb. Well, lets have a look at them. These aren’t super-detailed examinations like the regular Close Ups, just a quick look. First is The Sorcerer’s House. Click on the pics for a bigger view. 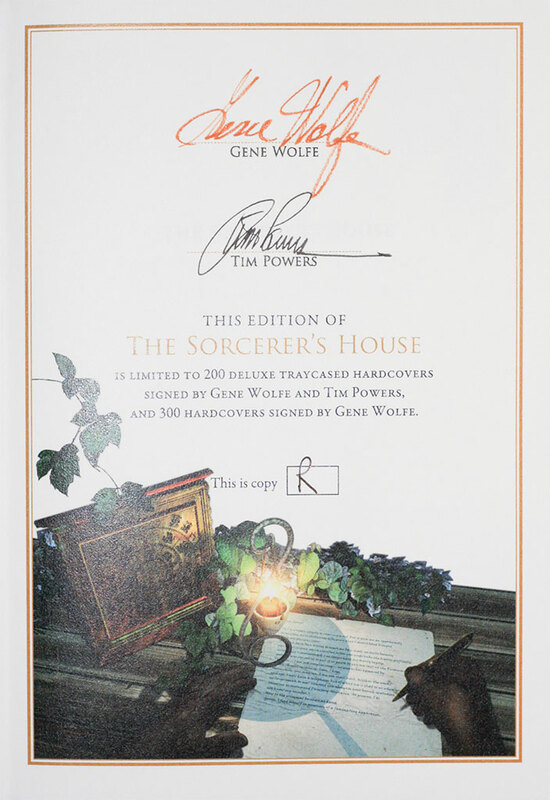 Beautifully tray-cased, and you can see the signature page there signed by Gene Wolfe and the author of the introduction, Tim Powers. If we crack it open and have a look we can see how nicely its presented. Unfortunately, you can see some nasty reflections there on the lower left of the jacket. This is because of the jacket protector I put on it a while ago. 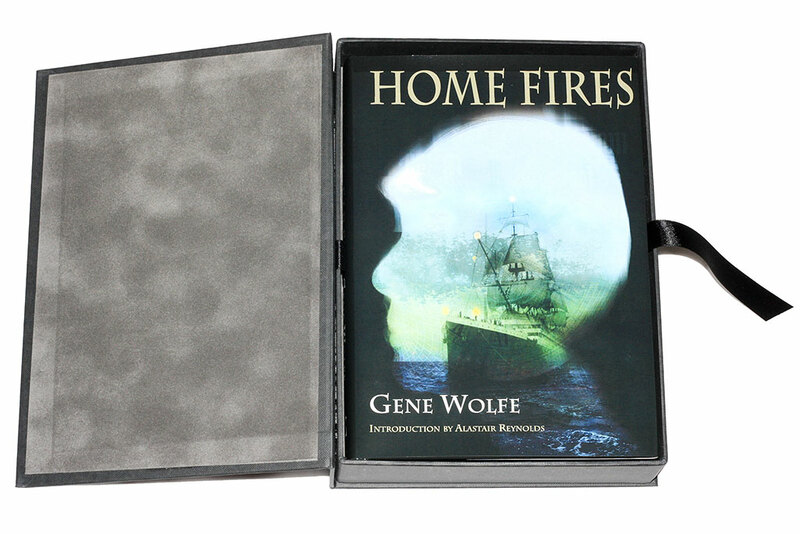 Having a look at my copy of Home Fires, note the identical presentation, though the signature page containing Mr Wolfe’s and Alastair Reynolds’ scribbles isn’t of the same high quality as that of Sorcerer’s. Incidentally, I’m on an Alastair Reynolds fix at present having listened to Chasm City, The Prefect, Revelation Space and Redemption Ark over the past couple of months, and currently on Absolution Gap. Although I mentioned consistency before, they aren’t consistent in one respect. The ribbon used to draw the book from the case is anchored on the left here, yet fixed to the right in the previous book’s case. Check it out. No reflections here – the jacket protector went on subsequent to this photo session. Back to the consistency thing, in the case of Sorcerer’s (pun intended..), drawing on the ribbon raises the spine end to be grasped whereas in this case (again, pun intended..), the open edge is elevated to facilitate withdrawal. I’m very happy small independent publishers like PS Publishing can give us attractive editions such as these. They are gorgeous editions from my favorite author and grand additions to my library.